Houston Skyline Pano at Twilight – Houston skyline at twilight pano with Allen Parkway as it runs along the Bayou and Eleanor Tinsley Park into downtown. Even after Hurricane Harvey the city has re-built itself back to it former self. You can also see the Jamal Skate park as it is lit up for the evening skatboarders at the blue hour. In this cityscape view your are looking at the Theater district of the city. Houston also has a reputation of a place to see top notched performing art along with access to several museums in the area. The Theater district performing art has nine major performing art group along with six performance halls. You can see Opera, a plays, the ballet and any number of music events including the well known Houston Symphony Orchestra. Houston is a large city with a population around 2.3 million people which makes it the fourth most populous city in the US and the biggest in Texas and the southern US. The Houston skyline is a very impressive site with some of the tallest modern skyscrapers buildings in the US. In this image you can see the Heritage Plaza, Chevron, Wells Fargo and the tallest building in Houston the J P Morgan Chase Tower at 1002 ft and it is the 17 tallest in the US. Houston is the seat of Harris county and was founded in 1837 near the banks of the Buffalo Bayou or Allen Landing as it is called today. The city was name after General San Houston after he won the battle of San Jacinto. Houston has been a growing city because of the port of houston and railroads along with oil boom from the early 1901. Houston has other industry that have made it thrive in america such as energy, manufacturing, aeronautics, and transportation. Also NASA mission control is located in the city. Houston has also taken the lead on health care with many people coming to the Medical Center for top notch doctors and hospital with the latest advancement in medical care. Houston skyline stock photos. Posted in Photo of the Day and tagged aerial, Allen Parkway, America, American, art, blue hour, buildings, Chase Tower, city, culture, downtown, drone, Elenor Tinsley park, heritage plaza, high rise, Houston, Houston cityscape, Houston images, houston skyline, houston skyline stock photos, Hurricane Harvey, images of Houston, images of texas, Jamail skate park, museum district, music, pano, panorama, population, skyline, skyscrapers, theater, twilight, urban, US, usa, wells fargo on November 29, 2017 February 13, 2019 by Bee Creek Photo. 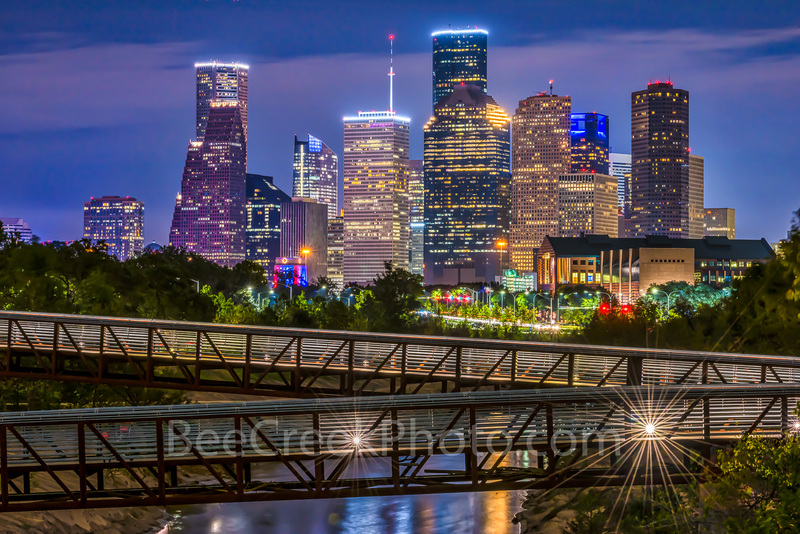 Houston Skyline Over Buffalo Bayou at Twilight – We captured Rosemont pedestrian bridge and the Houston skyline over the Buffalo Bayou at night in downtown area of the city. Houston has a lot to offer with many parks, cultural events in the theater district, along with many sport and music event to name yet a few things to do. Houston also has a reputation of a place to see top notched performing art along with access to several museums in the area. The Theater distric performing art has nine major performing art group along with six performance halls. You can see Opera, a plays, the ballet and any number of music events including the well known Houston Symphony Orchestra Houston has some top notch restaurants and places to stay. Houston has a population of around 3.4 million people it the largest city in Texas and the fourth largest in the nation. The skyline of Houston is a very impressive site with some of the tallest modern skyscrapers buildings in the US. In this image you can see the Heritage Plaza, Chevron, Wells Fargo and the tallest building in Houston the J P Morgan Chase Tower at 1002 ft and it is the 17 tallest in the US. Houston is the seat of Harris county and was founded in 1837 near the banks of the Buffalo Bayou or Allen Landing as it is called today. Posted in Photo of the Day and tagged 3.4 million people, allen landing, art groups, ballet, buffalo bayou, chase towers, chevron, city, color, cultural events, downtown, events, harris county, heritage plaza, houston skyline, music, night, opera, parks, pedestrian bridge, performing arts, plays, rosemont, sports, symphony orchestra, tallest buildings, texas, theater district, twilight, wells fargo on November 25, 2017 September 25, 2018 by Bee Creek Photo. Dallas Skyline Klyde Warren Park Night – Klyde Warren Park at night with the Dallas Skyline and the trees lit up in the park. The Klyde Warren Park is 5.2 acre park in the heart of the art district which sit over the Woodall Rodgers freeway in downtown Dallas. In the cityscape you can see some of the towering skyscrapers like the Chase Tower, Hunt oil building along with the Dallas Museum of Art. The park has a children’s play area, a dog park, open area for play or yoga, a restaurant, and on the days we were there they had many food trucks lined along the street to catch a quick bite to eat. Dallas skyline stock photos. Klyde Warren Park Night Pano – Klyde Warren Park at night with the Dallas Skyline and the trees lighted in the park. The Klyde Warren Park is 5.2 acrea park in the heart of the art district which sit over the Woodall Rodgers freeway in the downtown area of the city. In the cityscape you can see some of the towering skyscrapers like the Chase Tower, Hunt oil building along with the Dallas Museum of Art. The park has a children play area, a dog park, open area for play or yoga, a restaurant, and on the days we were there they had many food trucks lined along the street to catch a quick bite to eat. Dallas skyline stock photos. Posted in Photo of the Day and tagged art district, Chase Tower, children play area, cityscape, Dallas Skyline, Dallas skyline stock photos, dog park, food trucks, Hunt Oil Building, Klyde Warren Park skyline, night, pano, panorama, restaurant, skyscrapers, stock photos, trees lighted, Woodall Rodgers freeway, yoga in the park on November 24, 2017 September 25, 2018 by Bee Creek Photo. Dallas Skyline Pano in Pink in Solidarity with Susan Komen Race for the Cure – A Dallas Skyline in Pink pano as the city celebrates another year of the Susan G Komen race for the cure in downtown part of the city. The Dallas skyline has some of the tallest buildings in Texas second only to Houston with the Bank of America being one of the tallest building in the Texas. The modern architecture in this cityscapes it what keeps us comming back to photograph such a beautify city. We were surprised when many of the high rise buildings in downtown were lit with pink for this years event. This is year 35 of the race in the city it started in, all to benefit rasing money to help find a cure for breast cancer. The city skyscrapers including the Reunion Tower, Bank of America along with the Omni Hotel all showed their solidarity by lighting up the Dallas Skylin in pink on the final day of the Susan B Komen Race for the Cure event in downtown Dallas. A great cityscape for a good cause. We will donate 10% of the sales of this image to the Susan Komen foundation. Dallas skyline stock photos. Dallas Skyline in Pink Pano – A Dallas Skyline in Pink pano as the city celebrates another year of the Susan G Komen race for the cure in downtown part of the city. This is year 35 of the race in the city it started in, all to benefit rasing money to help find a cure for breast cancer. A great cityscape for a good cause. We will donate 10% of the sales of this image to the Susan Komen foundation. Dallas skyline stock photos. Posted in Photo of the Day and tagged architecture, Bank of America, breast cancer, city, Dallas cityscape, Dallas Skyline, Dallas skyline stock, downtown, high rise, high rise buildings, Omni Hotel, pano, panorama, pink, race for the cure, Reunion Tower, skyscrapers, Susan G Komen on November 16, 2017 September 25, 2018 by Bee Creek Photo.